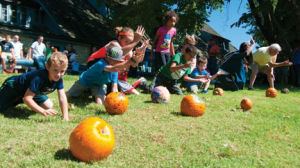 GRAFTON — The 2013 Apple Festival at the Pere Marquette State Park lodge featured activities for the entire family. 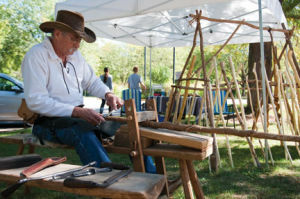 Starting at 11 a.m., lodge visitors were able to peruse a large selection of local vendors. Homemade mustard, dresses, popcorn and even apple-themed jewelry were offered next to booths owned by local orchards selling produce. Todd Fortschneider of Fortschneider Orchards was selling apples, pumpkins, squashes, and even sunflower tops full of seeds. “My favorite part of growing is coming out and meeting people at festivals,” he said. Krueger Orchard of Godfrey also had a booth with a large selection of gourds, pumpkins, squash, and, of course, apples. Also represented at the festival were Tom Ringhausen and Joe Ringhausen Orchards of Calhoun County. The first major event of the festival happened at 11:30 a.m. It was an apple pie walk, which is similar to a cake walk, only featuring apple pies instead of cakes. Tickets were a dollar, and proceeds went to the Pere Marquette Lodge Foundation. At 2 p.m., guests were able to bring pumpkins to the top of a steep hill near the lodge and roll them. If they did not have a pumpkin, they could obtain one from the festival and decorate it. Whichever pumpkin won the race would go on to the next round. Prizes were awarded to the top three. First place earned a free night’s stay at the lodge, second received a $50 gift card for the lodge restaurant and third received $20 for the restaurant. Throughout the day, events such as wine-tasting, parasailing and restaurant specials were offered. Children were able to partake in pumpkin decorating, fresh caramel apples and “apple snapping,” which Franklin described as “bobbing for apples without the mess.” During apple snapping, apples are tied to a tree with string instead of being thrown into a bucket of water to be fetched. Musical entertainment was provided by Outlaw Opry, a country band that specializes in covers and originals.